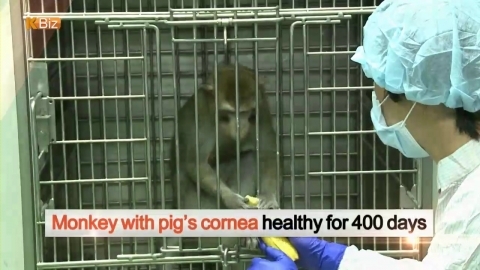 A monkey which has been transplanted with the cornea of a pig remains healthy for over a year. Researchers say that clinical trials for pig cornea transplants on humans are expected to be carried out soon. This is a pig, called "Mideumi" in Korean and genetically modified by the research team of the National Institute of Animal Science (NIAS) under the Rural Development Administration. Mideumi has a gene that causes excessive production of membrane cofactor protein, which helps prevent hyperacute and acute rejections in primates, according to the NIAS team. The first generation of the pig was born in 2010, and its fifth generation has now been used in various medical experiments. "Mideumi (the genetically modified pig) has been stripped of all the core elements that could cause transplant rejections, so we think that any organs can be transplanted (from Mideumi) to any primate species." The team transplanted Mideumi's cornea to three monkeys last year, and achieved better-than-expected results. The cornea of two of the three monkeys remained healthy only for six months, but the other one's cornea has been retaining its clarity for over 400 days. The Korean team claims that it is the world record in the research field as the monkey's healthiness has been sustained through the mentioned period without using any immunodepressant. The team plans to transplant the pig's cornea to five more monkeys to meet the World Health Organization's xenotransplantation guidelines. The WHO guidelines require that two out of the five monkeys should have normal cornea function such as standard cornea thickness and clarity for more than six months. If new legislation to allow such xenotransplantation is granted and a social consensus is established, some 2,000 patients who wait for a cornea transplant would hear good news in the near future.